This publisher specializes in publishing books about all type of sports and has been around since 2003. They are the publisher for example for two books by Glenn Guzzo (including "Strat-o-matic Fanatics"), the amazing books by Bill James and John Dewan - "Fielding Bible". They have been involved with Baseball Statistics since 2006 and have a connection with the organization called STATS which also features the most indepth statistics related to Baseball. We have negotiated with Acta Sports to give our members a 10% discount on all of your purchases with them. To find the specific book you want, just click on the link below and it will take you to the webpage of that e-book, of course you can look around for the other books too. How does this discount work? We are told if you go to the page link we provide below our discount code of "SOMB" will automatically be entered for you but when you go to your shopping cart, underneath the last book to order is an area titled "Promo Code", if "SOMB" is not shown in that area, type it in and hit submit, the price of all your books will be updated to include the discount. This special discount is only for our members. And if you visit the ACTA Sports website (www.actasports.com) and see other baseball books you like, again use this Promo Code to continue to receive a discount on any books you order. -- Wolfman Note: A Review copy is coming and we will review this book in a future issue of our newsletter to give you our perspective - but this is the only book we know that has ever been written exclusively about Strat-o-matic! -- Wolfman Note: We hope in the future to get a copy of this book to review for our members. For any of our members who are in a draft league with the new 2017 cards coming out next year, this is and will be a key key book to help you prepare for building your team as his handbooks have been every year before and each year, they add new information and insights. I personally look forward to pour through its amazing contents and especially look at the projections for 2017!! "Safe at Home: Willie Mays Aikens by Gregory Jordan"
"To Wolfman Shapiro and the members of the Ultimate Strat Baseball Newsletter. Best of luck to the team at the Ultimate Strat Baseball Newsletter. I pray God will continue to bless the whole group. Willie Mays Aikens 09-23-2014." If you are enjoying the content and information our newsletter shares with you, why not support us with your helpful donation for our minor expenses and time? ♦ INTERVIEW with SEAN PLOUFFE, HITTING A BASEBALL, Sean is a pro hitting consultant who works with various minor league and major league players to help them with their swing to be able to be more efficient in hitting a baseball. In this interview we discussed how Sean was able to become this hitting consultant. 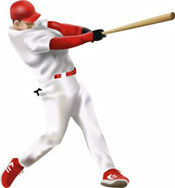 Perhaps Sean can help some of our members hit a baseball better in your physical baseball leagues? ♦ SOM/MAJOR LEAGUE BASEBALL WORLD NEWS with WOLFMAN SHAPIRO, editor of "The Ultimate Strat Newsletter" roams the world for interesting news linked to SOM or MLB. For this month he shares some gems he found on the Strat-o-matic website, offers two more "Stat of the Week" bulletins through Baseball Info Solutions (John Dewan and Bill James), a special announce of a new draft guide coming out in January through our team in conjunction with Strat-o-gists, new videos on our Youtube channel and a gift shared with our members by a former contributor. ♦ EARLY SOM BASEBALL CARDS with TOM	NAHIGIAN, Wolfman's old Strat Friend, Tom Nahigian, known as the "Collector" in Guzzo's book, returns to us as we share images of some of the early SOM baseball cards made for the 1960 season, before Strat-o-matic created the advanced cards that we all know today. This is one of our favorite periodic columns by our members, also check the links on this page to view the previous release of the early card image from 1960 and 1961. ♦ ARTICLE with Chuck Tinkler, Chuck is one of our most popular contributors and is back with a new article for his column, "The Chuck Stop", as he shares with us part one of what he calls "Old Guys Rule". This article deals with the value of a 1st round draft and more - Chuck always entertains our readers with his insightful and colorful stories and experiences - check his new article out now! 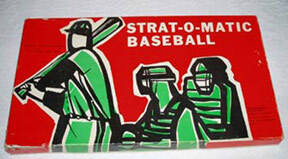 ♦ RECOMMEND ON-LINE SOM RESOURCES -- On-line Strat-o-matic and Baseball related websites that offer amazing information, special tools and products to improve your game play that we strongly recommend. In most cases, we have had personal contact with these sources who agree with the principle to work together and help promote each other.